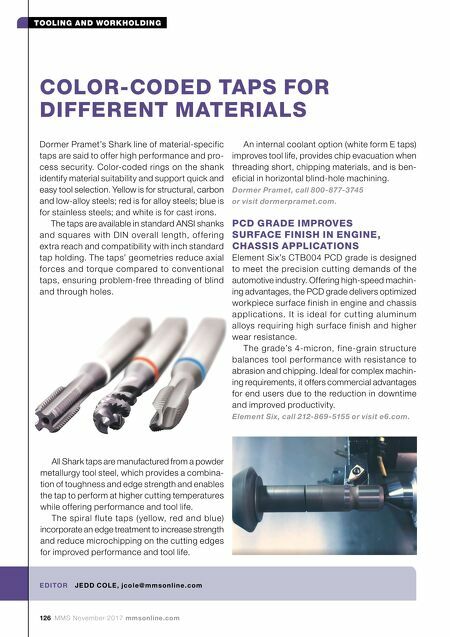 126 MMS November 2017 mmsonline.com TOOLING AND WORKHOLDING Dormer Pramet's Shark line of material-specific taps are said to offer high performance and pro- cess security. Color-coded rings on the shank identify material suitability and support quick and easy tool selection. Yellow is for structural, carbon and low-alloy steels; red is for alloy steels; blue is for stainless steels; and white is for cast irons. The taps are available in standard ANSI shanks and squares with DIN overall length, of fering extra reach and compatibility with inch standard tap holding. The taps' geometries reduce axial forces and torque compared to conventional taps, ensuring problem-free threading of blind and through holes. COLOR-CODED TAPS FOR DIFFERENT MATERIALS E D ITO R J E D D CO LE , jc o l e @ m m s o n l i n e.c o m An internal coolant option (white form E taps) improves tool life, provides chip evacuation when threading short, chipping materials, and is ben- eficial in horizontal blind-hole machining. Dormer Pramet, call 800-877-3745 or visit dormerpramet.com. PCD GRADE IMPROVES SURFACE FINISH IN ENGINE, CHASSIS APPLICATIONS Element Six's CTB004 PCD grade is designed to meet the precision cutting demands of the automotive industry. Offering high-speed machin- ing advantages, the PCD grade delivers optimized workpiece surface finish in engine and chassis applications. It is ideal for cut ting aluminum alloys requiring high sur face finish and higher wear resistance. The grade's 4-micron, fine-grain structure balances tool per formance with resistance to abrasion and chipping. 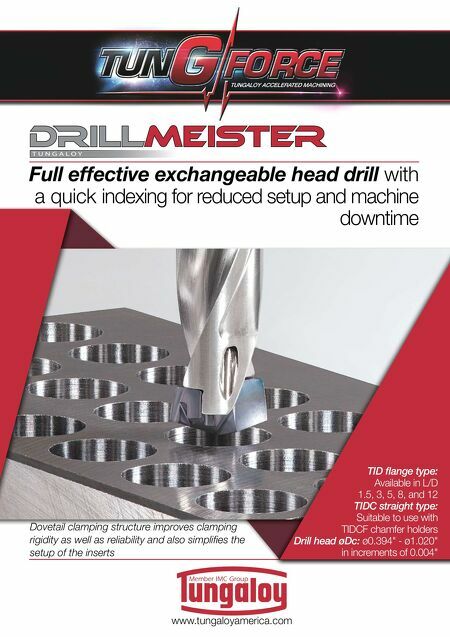 Ideal for complex machin- ing requirements, it offers commercial advantages for end users due to the reduction in downtime and improved productivity. Element Six, call 212-869-5155 or visit e6.com. All Shark taps are manufactured from a powder metallurgy tool steel, which provides a combina- tion of toughness and edge strength and enables the tap to perform at higher cutting temperatures while offering performance and tool life. The spiral flute taps (yellow, red and blue) incorporate an edge treatment to increase strength and reduce microchipping on the cutting edges for improved performance and tool life.